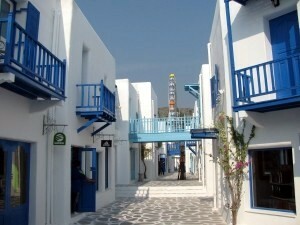 Santorini began as a small theme park, mostly a shopping arcade in a Greek style architecture, with a few attractions. 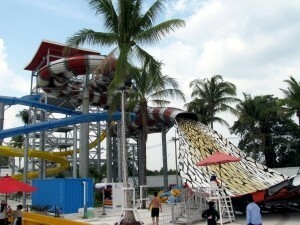 Then more attractions were added, and in 2013 a large waterpark was built, putting Santorini (and Cha-Am) on the map. 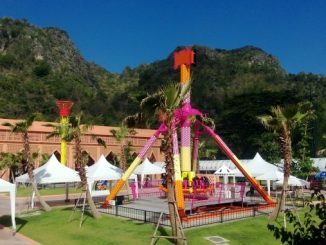 Just like the Factory Outlet (which is under the same management as Santorini, by the way), Santorini Park has shops for several brands, but also a few attractions, like a Ferris wheel, a merry-go-round, a haunted house, a 3D cinema or a reverse bungee jumping for those who like thrills. Attractions are quite expensive (120 baht for a 5 minute ride in the merry-go-round, for instance) and there is an entry charge (50 baht per person). 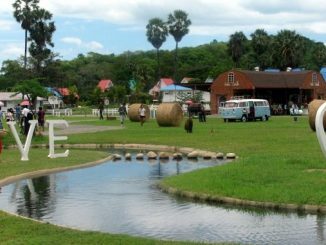 With its Greek style architecture and a setting designed so that visitors can take pictures of themselves at every corner, the park is in the same vein as all the “exotic” resorts that can be found in other popular holiday destinations for Thai people, like Suan Peung or Khao Yai. 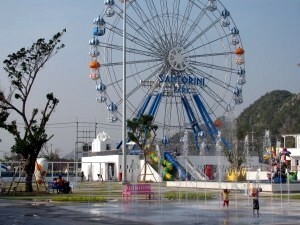 The Ferris wheel, a new landmark on the road from Bangkok to Cha-Am. 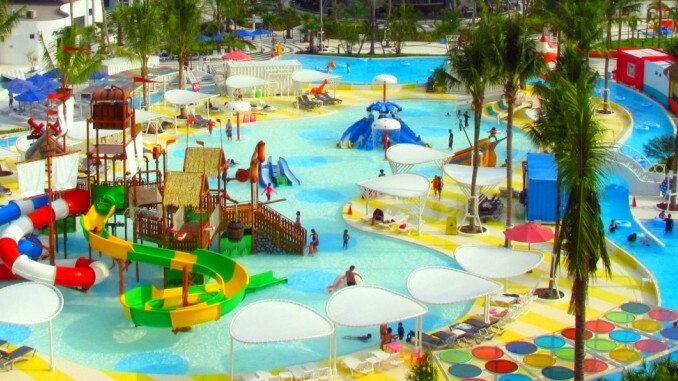 It was unbelievable just a few years back, but Cha-am now has its own waterpark, and it’s a full scale one, with plenty of sliders, a lazy river, a big wave pool, and, did I mention it already, plenty of sliders. 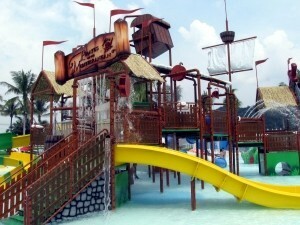 There are attractions for all ages, and little children will love the park just as much as teenagers and grown-ups. The only drawback is that food and beverafe from outside are not allowed, so it’s an expensive day out for a whole family. But it’s worth it. Besides all classic forms of sliders, you will be thrilled by the infamous snake and the yellow “high drop” sliders. Some sliders have to be ridden on a tube, and for some you have to be two people on the tube. Life vests are provided should you need one. There are restaurants, locker rooms, showers… you can even use a hair dryer. The whole park is a smoke free area but you can go out and get in again at any time. 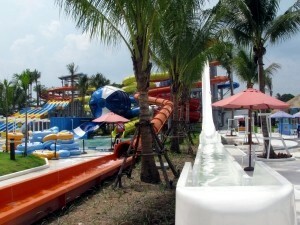 Entrance is 800 baht for adults and 500 bahts for children, residents get a 100 baht discount. 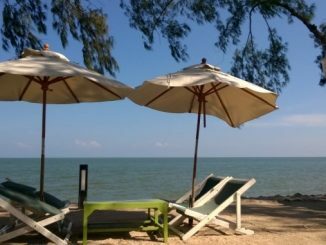 If you are a foreigner living in Thailand, you will have to show either a work permit, a driving license or a yellow tabien ban (or even nothing if you can speak Thai). Check the official website (link below) for the opening time, as it seems to vary. 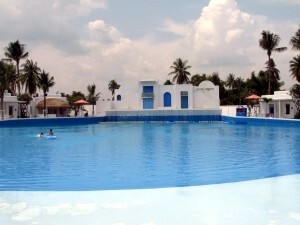 There are also “cabanas” (bungalows) available for rent inside the park. 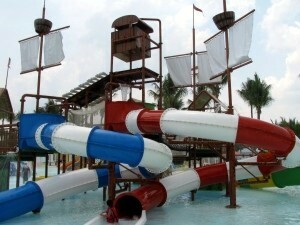 Santorini Park is on the left side of the road in the direction of Bangkok, after the interchange between the road to Hua Hin and the bypass road, and before you reach the Factory Outlet. More pictures and discussion in our forum. 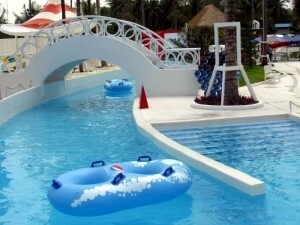 For more information, visit santoriniwaterfantasy.com.